Tariffs – taxes on imported goods – likely impose a heavier burden on lower-income households, as these households generally spend more on traded goods as a share of expenditure/income and because of the higher level of tariffs placed on some key consumer goods. 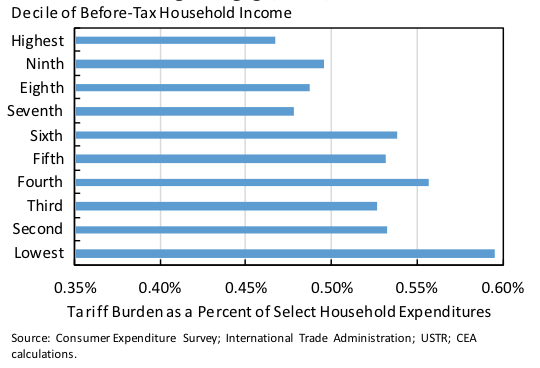 This column estimates the tariff burden by income group and by family structure using a new dataset constructed by matching of granular data on trade and consumer spending. 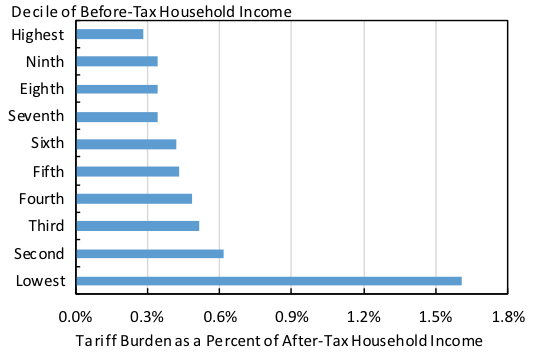 The findings suggest that tariffs function as a regressive tax that weighs most heavily on women and single parents. 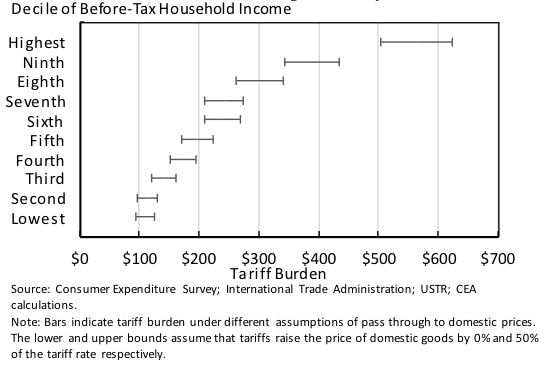 To estimate the distributional effects of tariffs across households, we constructed a new dataset by matching tariffs collected by US Customs and Border Patrol as reported by the International Trade Administration’s (ITA) Trade Policy Information System (TPIS) database with goods categories in the 2014 Consumer Expenditure Survey (CEX) administered by the US Bureau of Labor Statistics. In total, the dataset we construct matches 381 consumption categories to their relevant tariff. By matching HS codes to CEX categories, we create an average effective tariff rate within each consumption category dividing tariffs collected by imports.1 The calculation will not include the impact of tariffs via intermediate inputs, only from imported consumer goods. The dataset with aggregated consumption categories is available publically for researchers here.2 Details on the construction of the dataset and its interpretation are provided in the Appendix. 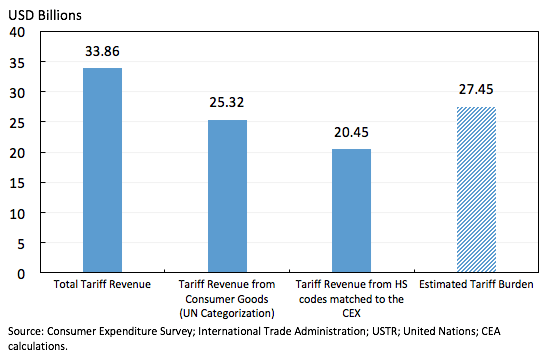 For this analysis, we construct a new data set (available here) that combines information from detailed tariff data from the Harmonized Tariff Schedule published by the US International Trade Commission (USITC) and consumption data from the CEX. The matching of the tariff lines to consumption categories allows us to calculate the tariff burden across groups. The dataset with aggregated consumption categories is available publically for researchers here, and the pre-publication tables containing the more detailed categories used in the crosswalk are available upon request from BLS. We encourage other researchers to use these data and or extend and improve the match process. Anderson, J and P Neary (2007), “Welfare Versus Market Access: the Implications of Tariff Structure for Tariff Reform.” Journal of International Economics, vol. 71(2) (March), pp. 627–49. Edmond, C, V Midrigan, and D Xu (2015), “Competition, Markups and the Gains from Trade.” American Economic Review, forthcoming. Feenstra, R C and D Weinstein (2016), “Globalization, Competition, and U.S. Welfare.” Forthcoming, Journal of Political Economy. Gale, W G and P R Orszag (2004), “Bush Administration Tax Policy: Distributional Effects.” Tax Notes 104.14: 1559-1566. Gresser, E (2002), “Toughest on the Poor: America’s Flawed Tariff System.” Foreign Affairs 81: 9. Jara, C C M and A M del Carmen Vera Ganoza (2014), “Estimation of the Pass-Through and Welfare Effects of the Tariff reduction for Yellow Corn in Peru Between 2000 and 2011.” Trade Policies, Household Welfare and Poverty Alleviation: 243. Moran, T (2014), “Tariffs Hit Poor Americans Hardest.” Peterson Institute for International Economics Real Time Economics Watch. (31 July). Rosenberg, J (2015), “The Distributional Burden of Federal Excise Taxes.” Urban Institute and Brookings Institution Tax Policy Center. United States International Trade Commission (USITC) (2016), Harmonized Tariff Schedule. World Trade Organization. Tariff Download Facility. We use the disaggregated categories, for which the expenditure breakdown by deciles of before-tax household income and demographic groups are available in the pre-publication tables upon request from BLS: http://www.bls.gov/cex/csxresearchtables.htm#allnew.